DJ Cal Jader hosts a mash-up of dancefloor heavy Latin beats. This month welcoming one of the hypest Latin crews in London – Philips man & Lolo mc bringing Cuban flavour to Notting Hill. DJ Cal Jader hosts Muevete! – a monthly fiesta in West London – a mash-up of dancefloor heavy Latin beats and tropical bass with the spirit of carnival. This month we’re gonna be welcoming one of the hypest Latin crews in London – Philips man & Lolo mc all the way from Cuba and now based now in the UK bringing Cuban and Caribbean flavour to Notting Hill. Together they have more than 17 years of experience in making you jump, sing along and dance to original Cuban songs! 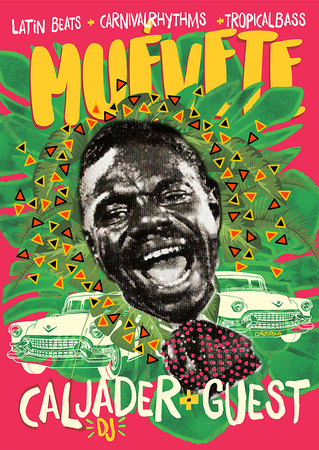 A favourite for Saturday night crowds in West London, Muevete is a monthly fiesta – a pure party version of Movimientos, with a dance floor-slammin’ mash up of raw Latin beats and tropical bass. From Salsa to Cumbia, Merengue and Samba to Reggaeton, Latin Hip Hop, Brazilian beats and Carnival bass, alongside Afrobeats, Dancehall, Soca and Global Bass. Venue Details: Notting Hill Arts Club, 21 Notting Hill Gate, London W11 3JQ, United Kingdom. Artists / Speakers: DJ Cal Jader, Philips man & Lolo mc.